I know for a fact that people do not read when they visit a website. You can bold the text. Make it orange and ALL CAPS. Move it to the most prominent place on the site. And they still call to ask you where to find stuff. I do a fair amount of content editing and creation. And one thing that I have learned is that very smart people like to use a lot of words. A lot of very BIG words. This was amusingly demonstrated in "How I Hacked Online Dating," a TED Talk by Amy Webb. Amy found out that like her many highly educated and intelligent peers, her profile on an online dating site was 4,000 words long. No one was reading it. In fact, by analyzing the most effective profiles, she learned that the most read ones were at most 100 words long. Zoltán Gócza and Zoltán Kollin are two web design experts who believe that people should build websites based on evidence instead of myths. On their fantastically useful website UX Myths, they list the 32 most frequent user experience misconceptions and explain why they don't hold true. You should read all 32, but I will summarize the #1 Myth: "People read on the web." People only read word-by-word on the web when they are really interested in the content. They usually skim the pages looking for highlighted keywords, meaningful headings, short paragraphs and scannable list. Since they’re in a hurry to find the very piece of information they’re looking for, they’ll skip what’s irrelevant for them. In 2013, analytics vendor Chartbeat found that most visitors scroll through about only 50-60% of an article page. A 2008 eye-tracking study showed that less than 20% of the text content in an average web page is actually read. In another usability test, researchers found that concise, scannable and objective copywriting resulted in 124% better usability. 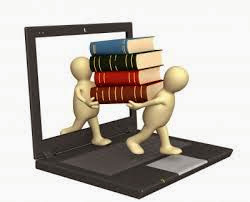 Ergo, well structured pages that are designed for cursory reading are more likely to be read. So trust me when I slash and burn my way through your copy. The other day I started to think about my long standing relationship with computers - astonishingly it goes back 40 years. Though I was always intrigued, I did not fall in love right away. Late 1960s - I go to a meeting of the 8th grade computer science club. Club activity seems to center primarily around creating punch cards which are in turn fed into a machine that produces a simple data output. Does not meet my expectation of the computing experience, primarily gleaned from watching Captain Kirk speaking to the Starship Entreprise's computer. Mid 1970s - still looking for a computing high, I enter the Yale University Computer Science Lab. It's late at night and the room is filled with computers that emit a greenish glow against a black background. 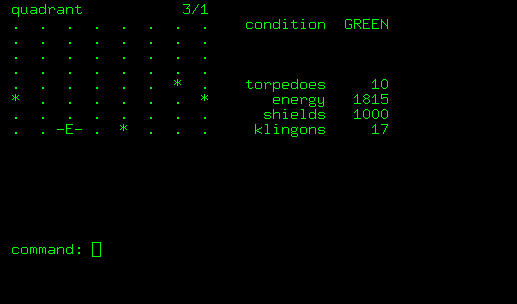 Everyone seems to be playing Star Trek, a text-based computer game that puts the player in command of the USS Enterprise on a mission to hunt down and destroy an invading fleet of Klingon warships. The game is played by laboriously inputing coordinates which in turn control the photon torpedoes necessary to annihilate a Klingon ship. A single move can take minutes. 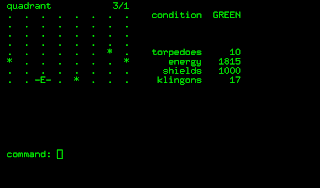 The screen shows dots and blips representing ships. (See top left photo of a typical Star Trek screen. Not quite as engaging as your nephew's "Call of Duty: Black Ops.") This is not for me. Early 1980s - I go to the upper West Side apartment of one of my Columbia University social work graduate students. We are writing a manual together. She owns the very first home computer I have ever seen: an uninspiring word processor with a tiny screen. The screen fills with the words we are writing together. I know the machine is very expensive. In fact, she is the only person I know who has one. I am still uninspired. 1991 - I work in one of the satellite offices of a large national employee assistance program (EAP). The only person who has a computer is the secretary. You wouldn't know it, but she is the most powerful person in the entire office because she is the only one who knows how to operate this machine. The machine does only two things, word processing and Excel. One day we get a memo from company headquarters: "anyone interested in learning Word and Excel can do so on company time." Interested parties will receive VHS instructional tapes. I'm sick of depending on the secretary for my correspondence, so I sign up. I am the only one in the office to do this. 1996 - I am now the Director of Account Management at an EAP in Manhattan. I am given my first office computer, a Mac PowerBook which I do not know how to operate, having previously used a PC. My boss, upon noting that my resume stated proficiency in Word and Excel, promptly puts me in charge of making everyone in the office computer literate. My target population is 25 social workers and psychologists who have also just been given PowerBooks. Not only do they not know anything about computers, but they hate them. And they are highly resistant to being converted. Fortunately, I have an ally: our Apple tech support guy Nathan. Nathan is a disgruntled former attorney turned Mac support person. He knows about computers and is actually able to use the English language to explain them. He teaches me. Eventually, I teach everyone in the office how to word process and send e-mail. 1999 - I learn how to use Microsoft Publisher to create corporate newsletters. 2008 - I attend a social media boot camp. Five minutes into the camp, I learn about blogging and fall madly in love. I start this blog. 2009 - I get an iPhone3GS. 2010 - I get a MacBook Pro and a first generation iPad. 2012 - I get an iPhone 4s. 2013 - I get an iPad Mini. This is going to be a very long affair. In 1982, preeminent futurist John Naisbitt coined the phrase "high tech, high touch." The phrase can be defined as "embracing technology that preserves our humanness and rejecting technology that intrudes upon it." Please observe a moment of silence as you reflect upon the fact that Naisbitt came up with this amazing concept in 1982 before the Internet, the personal computer, the iPod, and the smartphone even existed. How did he know what author Abha Dawesar discovered when she lost power in 2012 during Hurricane Sandy? She found out that along with a daily search for food and water, a major preoccupation was the search for an outlet where she could charge her electronic devices. As she observed in a brilliant 2013 TED talk: "I think there's nothing like a crisis to tell you what's really important and what's not, and Sandy made me realize that our devices and their connectivity matter to us right up there with food and shelter." To me, high tech, high touch has evolved to describe the pairing of high technology with human craft. We crave objects that embody the highest human touch. But we use high tech wired tools like the Internet and social media to find them and easily acquire them. Take Made in Days. "Made in Days" is two guys who produce very, very small quantities of artfully designed wallets and use a beautiful, state of the art website to display their wares and their craft. I found the company on a blog post about cutting edge web design. I use Stumbleupon.com every week to discover web sites based on my specified interests, which include cyberculture, web development, futurism and gadgets. 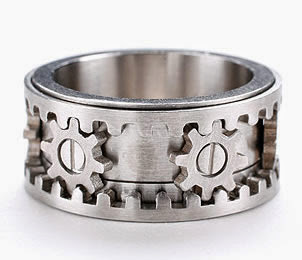 Several months ago, up came Kinekt Design, another two person operation that primarily sells just one thing, a patented, completely unique Gear Ring. Kinekt prides itself on its extremely attentive and personalized service, as well as providing a lifetime guarantee for the ring. I found Grovemade on Instagram. "Grovemade" is a small cadre of Oregon based Millenials who hand make gorgeous iPhone and iPad accessories out of sustainable bamboo. Check out this gorgeous iPhone dock. As technology becomes increasingly ubiquitous and powerful, we will look for ways to preserve our humanity. 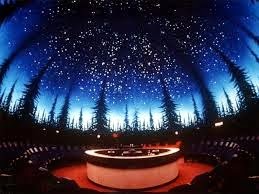 When is the last time you visited a website and you were thrilled/blown away/amazed? It happened to me today. Repeatedly. And all because I came across an innocuous sounding blog post: "Full screen: new trend in web design." Let me begin by explaining that full screen websites literally envelop the user in an immersive visual experience. It's sort of the visual equivalent of surround sound. 1. Nestea introduces a new beverage. Think you need to be a big corporation, with a big budget to use full screen design? Think again. I feel like I just went to Disneyland.